It isn’t time for chow yet so I’ll write a few lines this evening. I had a special liberty over the weekend so didn’t go out last evening as I was tired and had some washing to do. I expected to have a guard tonight but didn’t get it so it will probably come tomorrow. Greenfield Village has opened so we went thru it Sunday. We spent four hours there and didn’t see nearly everything so you can imagine how much is to be seen. A bus took us inside the grounds to the waiting room from where the tours start. Tickets for the museum and the village cost twenty-five cents apiece but are well worth it. We went thru the village first. It consisted largely of famous old buildings, most of which are the originals though a few are relipicas of the originals. Quite a number of the exhibits are connected with the life of Edison, who was a great friend of Mr. Ford. The depot in which Mr. Edison sold papers when a boy is there but we didn’t get to go thru it. We saw it from a distance and it looked just like any ordinary depot. The building in which Mr. Edison carried on most of his experiments is there, fixed just as he left it when he completed his experiments with the light bulb. Wallace, do you remember in the show “Edison, the Man,” where the boy came running up the stairs, fell and broke the light bulb? The stairs are just the same as in the picture. Edison visited the Village in ’28 or ’29 and lit a fire which has burned continuously ever since. In reconstructing one place, Mr. Ford brought seven carloads of dirt from Vermont to make it more realistic. One place called the “rose house” is from someplace in England where they used slate for the roofs. The barn was brought over too and since some sheep were needed, they were brought from England too. We went thru an old grist mill which uses stone wheels to grind the wheat and corn into flour. The flour is sold for souveneirs at the waiting room. We saw wool carded, spun and woven into goods, using the old-fashioned hand methods. In the museum we saw all kinds of chinaware, antiques, guns, farm implements, cars, trains, buggies, airplanes, in fact nearly anything you might mention. There were cars of all kinds, the first ones which Mr. Ford made and cars of a great many other makes. Steam cars, electric and gas models. A person could spend a day in the museum alone. We saw engines of all sizes up to 4,000 horsepower. Old and new locomotives, several airplanes. 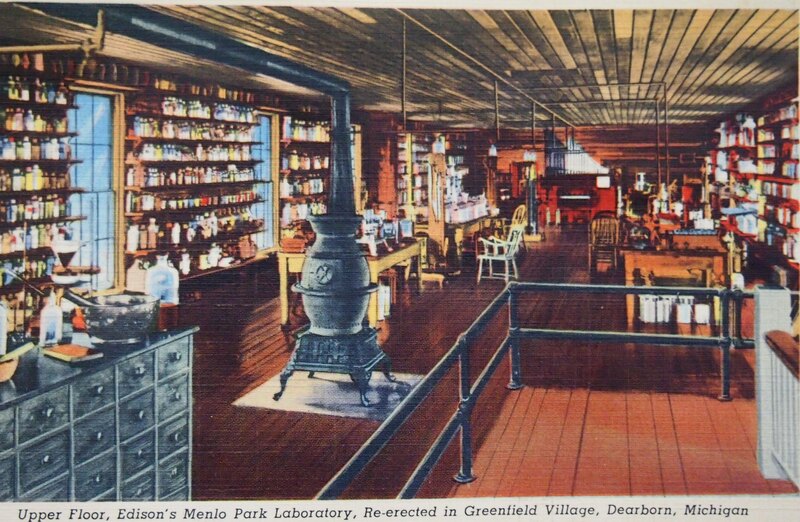 There were exhibits of nearly all of Edison’s inventions. Wallace would have enjoyed those. We left about four o’clock as we were tired and Megdalls wanted to go out for the evening so Josephine had to stay with the little girl for the evening. I got three different rides coming back to the station. The second car to pick me up was a man and woman who were coming out toward the station. Before we had talked very long the lady asked “what part of the South are you from?” Lots of people ask me that question. I don’t notice their talk being any different from ours but they know that I am a “foreigner.” I got a letter from Frances yesterday. She said that Betty and Al had been there and gone again. It was sure nice that they could come. We have had chow now and lots of the boys are here in the reading room writing letters as it is much quieter than in the barracks. We had spare ribs, potatoes, peas, lettuce with dressing and gingerbread. We had iced coffee too but it isn’t any better than hot coffee. I thought it was ice tea and took a swallow of it before I knew what it was. Has it rained yet? It won’t be so very long before time to cut wheat, will it? How big is the corn? Not very big yet, I suppose. I’ve run down so will say good-bye. 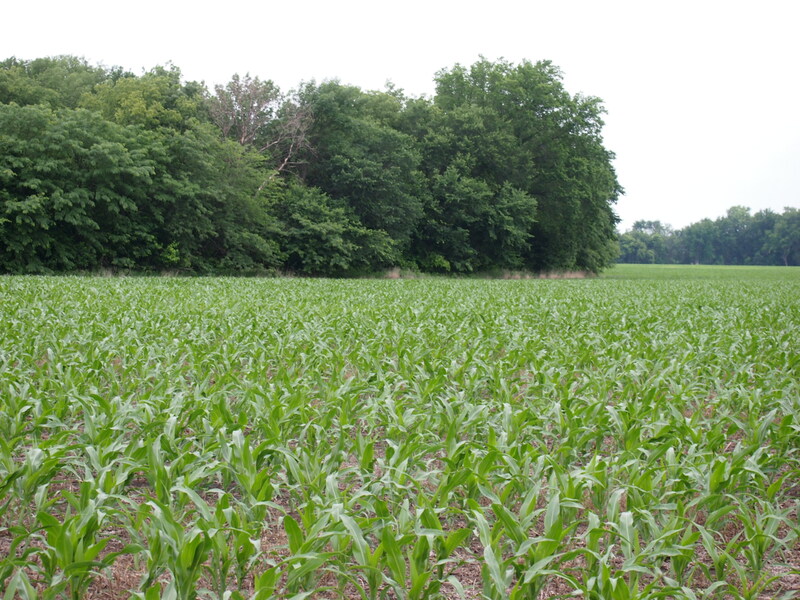 Corn field on the home place.